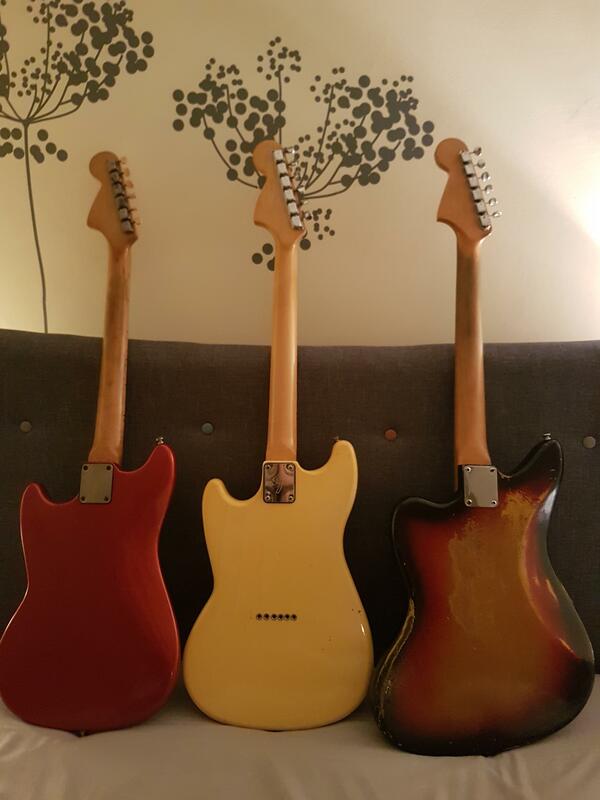 Picked up a 1978 Musicmaster a few weeks back complete with original WRHB. Always been curious about the WRHB as I never really got on with HB's but I quite like this one. Still find myself reaching for the non existent tremolo & the neck feels slighter fatter than my other guitars but its a great sounding fun guitar. Still tinkering with the 3 saddle bridge. Nice, know it's not the subject of the thrread but I love that mustang. I bought that off Pat a couple years ago. Its been re fretted & had a Staytrem bridge dropped in as it suffered the classic e string slippage. Also bought an original 60's tort guard & some white pup covers. The switches has been rewired & sunken lower with a couple washers. Switch nearer the bridge is In phase/out of phase/bass boost. I love it but has a very thin neck so short bursts or I get a cramp. my friend Dan used to have this back in 2005.
good times with that thing. I've got a black 1978 musicmaster, and I love the neck on it. Quite thick, as you say. How does the humbucker sound? Correct, modded before I got my mitts on it. Well the single coil in the neck sounds lovely & warm. The humbucker has less bass is a bit hotter as its pushes the amp into gain & sounds a bit quacky/phasey..... I'm starting to wonder whether the switch has been wired back to front? Going to open it up later & check. Either way a lot of sounds to be had from those two pickups. 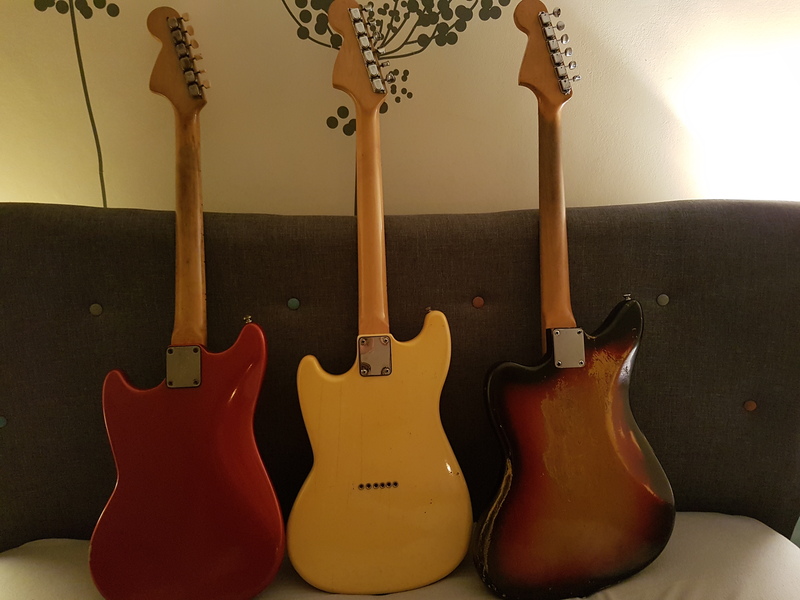 I really really like the neck, so much more comfy compared to the Mustang, perhaps my Mustang neck is thinner than usual? Neck thicknesses were all over the shop in the 60s and 70s. 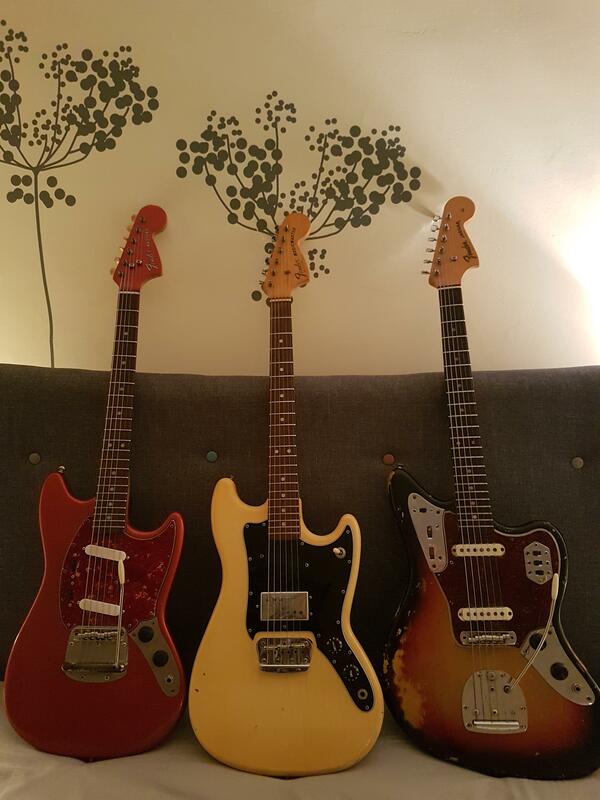 The only ones i’ve Played that have had a familiar feel were the Musicmaster’s I’ve owned. They are also my favourite Shortscale’s to play. 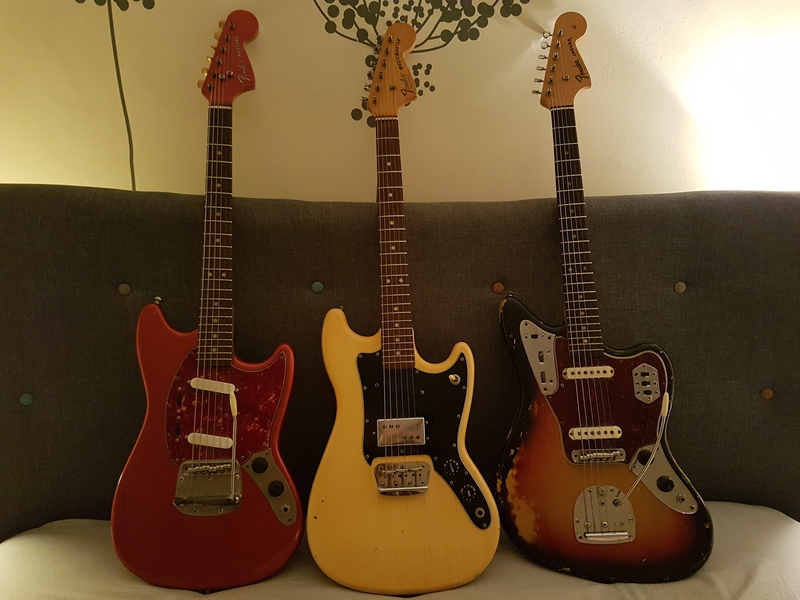 Every vintage Mustang I’ve had/played varied from super thin all the way to ultra chunky. The Bronco I had years ago had the thickest neck on any fender i’ve Ever had. This guitar looks amazing, the combo of those pickups is perfect. Ah didn't realise they varied so much. Was going to try shopping for a old neck (shame as i've had this one refretted) but may be easier to get a new one from Allparts. Only if this is in the neck-and-bridge position; a humbucker shouldn't sound phase and quacky on its own?? Unless someones repaired it and fucked it up..
All sorted now, I lowered the pickup & it sounds like I'd expect. Its more balanced with the single coil now. Also fun matching the poles to each string for a nice even spread. heh, i have committed that sin in a past life... "PUT THEM POLES RIGHT UNDERNEATH THE STRINGS FOR MAXIMUM MET0LZ"